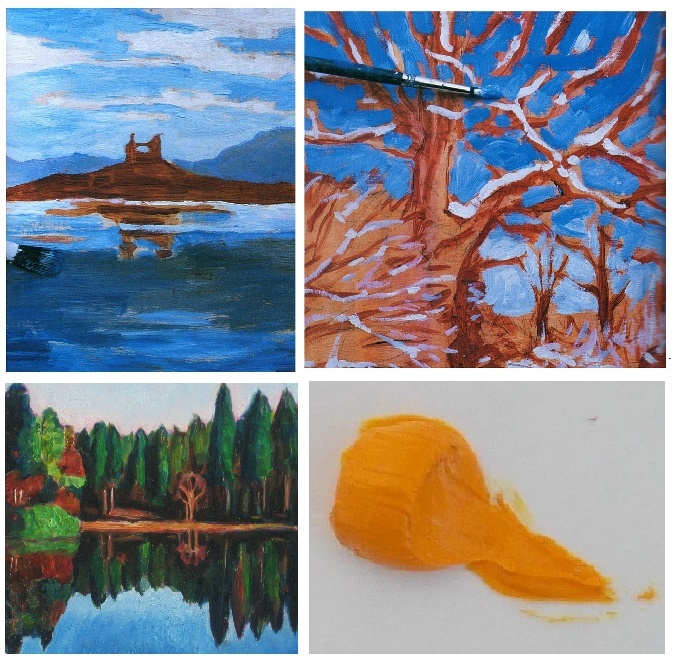 Artclass challenge: I’ve Never Used Oil Paints Before: What are Oils and How Can I Use Them? I’ve Never Used Oil Paints Before: What are Oils and How Can I Use Them? Starting out in oil painting? Well you might notice that every art shop will stock traditional oil paints. Tubes bearing the word ‘oils’ or ‘oil paint’ (meaning the same thing) will also bear other labels, such as the brand name, grade and quality. It all seems overwhelming. However, oil paints all have one thing in common. The pigment is simply suspended in oil. This mean the paint cannot be cleaned or thinned with water but artist spirits and special oils. Deposit a little oil paint onto an art board, and you will find a creamy, rich substance rather like butter. What you see is finely ground pigment blended with a little oil. The pigment aspect might be ground organic substance or a synthetic substitute. This provides the color. But the pigment is nothing without a vehicle in which it can travel. With watercolors, it is water; in this case of, oils, it is, well, oil. But not any oil is used in the paint, but one that is stable and resistant to darkening over time. So you will not find household cooking oil, but linseed oil. Linseed oil will be found in most tubes of oil paint with the exception of white, where poppy oil will be used, as it is paler. Oils can be applied in many ways. Applied neat, oil paint will leave ridges and troughs, rather like the textures after a rough session of plastering. Such a technique is known as ‘impasto’. Artists such as Van Gogh, Monet and Picasso used impasto techniques to bring a textural quality to their paintings. A stiff brush or a palette knife can be used to apply thick oil paint for impasto effects. Can Oil Paint be Used like Watercolor? It might be hard to believe, but oils can yield similar effects to watercolor if thinned down and applied as a wash. In oil painting, such a wash is known as a ‘glaze’. As previously mentioned, oils cannot be thinned with water, but a medium that can be suspended in the oil paint. A range of oil mediums and artist thinners can be found in shops, but the ones most often used are linseed oil and artist spirits. Artist spirits are simply solvents designed to be used for oil painting. Never use industrial Turps or solvents for thinning oil paint, for these are not designed for artist use. (They smell terrible and will wear the brushes). Artist spirits and linseed oil will be found in bottles. Don’t worry, as odor-free solvents that are kind to the nose and brush can be easily found in any art shop, and only a little medium is needed. Create a little oily-solvent mixture (by blending 50:50 solvent and linseed oil into a small dish) to create an oily ‘thinner.’ Add a little paint. The result will be a watercolor-like wash. This thinned paint can be spread over an artboard or canvas like watercolor. Just like with watercolor, you will need to experiment to get the consistency right. Too much thinner, and the wash will be too thin. Not enough, and the paint might not create a thin wash to travel. The great thing about oil paint is that once it is dry, the paint is remarkably robust and durable. In fact, a separate glaze can be applied on top once the paint is dry, and the underlayer will remain unaffected. This is known as glazing. Beautiful effects can be achieved by glazing thin layers of oil paint one over the other. What are the Difference Between Watercolors and Oil Paints? Here, I have described the two main techniques of oil paint that define its properties: impasto by the application of neat oil paint, and glazing by the application of thinned oil paint. Oils are fundamentally different to watercolors, for water is used in watercolors, but cannot be used in oil paints. Oil paint does not dry by evaporation, as does watercolors do, but by oxidization. This means that the paint absorbs oxygen from the air in order to harden. For this reason, the paint dries from within, taking about three days to two weeks to become touch-dry. A thicker layer of oil paint will take longer to harden than a thin layer. 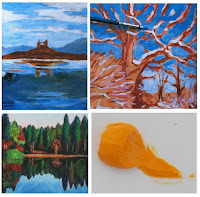 Because oil paints take longer to dry, it can be played around, blended with and manipulated without the need to rush. Great blending finishes can be achieved with oil paints, unlike acrylics, which will dry within the hour. Blending is no fun if put under time restraints! Don’t be confused by the many different types of oil paints that can be found in shops. Really, the traditional type has one thing in common: oil is blended with the powdered pigment to create the paint. Exceptions can be found in specialized oil paint, which do not apply to traditional oils, the subject of this article. So have a go. Learn the basics of oil paint by applying it neat, and then by thinning the pigment down into a watercolor-like wash.